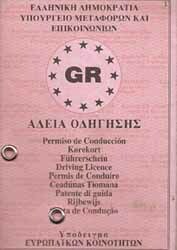 Driver’s licenses from other EU/EEA member states carry the same rights and standing as driver’s licenses issued in Greece and may be converted to a Greek driver’s license (άδεια οδήγησης/adeia odigisis or δίπλωμα οδήγησης/diploma odigisis) with minimum bureaucracy. Driver’s licenses from certain non-EU countries can and should be converted to a Greek driver’s license, without going through the normal process and expense of obtaining one. The procedure you follow depends on where your current driver’s license was issued. Your nationality/citizenship is only relevant when determining the waiting period in which you must wait to apply. *Article last updated September 22, 2014, with a major revision in 2013 from real-life experience, not official websites that rarely match reality and are (very) outdated. It is legal to drive in Greece with a driver’s license issued by other EU /EEA member states, Iceland, Liechtenstein and Norway without need to convert to a Greek driver’s license, as long as the license remains valid. Your nationality/citizenship is irrelevant. Conversion to a Greek driver’s license usually becomes an issue when the license will expire soon and cannot be renewed in its country of origin. EU directives say drivers must swap or apply for a driver’s license of the new EU/EEA member state after permanently residing there for one (1) year. Each EU/EEA country has different policies. Greece does not follow or enforce this directive. — Normally resident means residing in Greece at least 185 days a year. Non-EU/EEA citizens: Can begin 185 days after issuance of a residence permit card/sticker. A bebaiosi (blue paper with photo) is only acceptable if you are in renewal of a previous permit. See #1 and #3 of “Official Translations to Greek,” if you need help. See “How to certify a dilosi or other document,” if you need help. Sometime in 2014, the Ministry of Finance intends to allow applicants to pay fees online via the TAXIS website (gsis.gr). I will update when it’s operational. *Greek media/government announced on August 22, 2014 that KEP now handles transactions for driver’s licenses. This is baffling, as this has been the case for several years. It used to be that many could get away with carrying a driver’s license and an International Driver’s Permit (IDP) without concern for being stopped or risking penalties, but implementation and enforcement of the law have been stepped up as of January 2009. The fine is at least 200 euros and between one (1) to 12 months in jail. * Please note that an IDP is not a license. It is a permit that provides a translation of your existing, valid driver’s license. 1. Be in possession of a valid, unexpired license issued by Armenia, Australia, Azerbaijan, Belarus, Canada, Georgia, Japan, Kazakhstan, Kyrgyzstan, Latvia, Moldova, Russia, South Africa, South Korea, Tajikistan, Turkmenistan, Ukraine, United States or Uzbekistan. c) a non-EU citizen with an expired visa, who has applied for or is in possession of a residence permit. Evidence or admission of residency in many cases begins after 90 days and/or by registering for utilities (cell phone, phone, electricity, water, etc.) and/or upon signing a lease, mortgage, car loan or other agreement. Nationality/citizenship determines when you can start the process. Greek citizens can apply right away. Non-Greek EU citizens can apply 95 days after a document or permit/certificate can be produced as evidence of their residence in Greece. Non-EU citizens can apply 185 days from the date their residence permit/card was issued. A bebaiosi (blue paper with photo) is only acceptable if you are in renewal of a previous permit. — Stating that you do not hold a license from another country except the one being converted and have the physical and mental skills required to operate a vehicle in the relevant class. — Request it through the authority that issued your driver’s license (i.e., the Department of Motor Vehicles or Ministry of Transport), then have them send it to the Greek consulate/embassy in your home country/state, which will translate it to Greek and forward to the Ministry of Transportation in Greece. This method is stated because it is assumed you have given up your former residence and now live in Greece full time. Specify instructions on what you want done at each stage with a letter. — Must be from the Ministry of Foreign Affairs’ Translation Department or a lawyer, if it was not already done by the Greek consulate/embassy. See, #1 and #3 of “Official Translations to Greek,” if you need help. *Some doctors ask for two; some want one. There are no online forms and applications, which are advanced concepts in Greece. Everything is done in person. Sometime in 2014, the Ministry of Finance said that intends to allow applicants to pay fees online via the TAXIS website (gsis.gr). I will update when it’s operational. The only legitimate excuse for not applying for a Greek driver’s license is if, after 185 days, your residence/work permit sticker/card has not been issued since authorities cannot accept the bebaiosi (blue certificate of receipt with photo). *Greek media/government announced on August 22 that KEP now handles transactions for driver’s licenses. This is baffling, as this has been the case for several years. It normally takes less than a week for the application to be processed once you apply, and 20-30 days for issurance. When you pick up the Greek license in person, your current license will be confiscated, canceled and held on file. Should you decide to secure another license during a visit to your homeland, your Greek license will be revoked if you’re caught with both. Technically, Greek law does not permit a holder to have two licenses. However, I understand that many people have two licenses, keeping one at home for use in another country they visit frequently or as a convenience for ID purposes. A non-EU citizen who converts a non-EU driver’s license to a Greek one, then moves to another EU/EEA country, must contact authorities of the new country to check the validity of the converted Greek driver’s license. Most EU/EEA countries only recognize EU/EEA driver’s licenses held by EU/EEA citizens, not those held by non-EU citizens who swapped or converted a non-EU driver’s license. In that case, you would forfeit the Greek license and start again according to laws in the new country. A Greek license expires every 15 years. How do I replace a Greek driver’s license? The EU aims to standardize all driver’s licenses in member states with a credit card sized license bearing a swipe strip on the back side for easier identification and security reasons, similar to those being used in the United States. As of April 1, 2009, Greece started issuing cards to new drivers but has not made them mandatory for existing driver’s license holders with the pink paper booklet license. There is already an EU/EEA standard in place, but it is not mandatory or enforced. Thus, all member states have different rules and a combined total of 110 different licenses of varying size, color and composition. It is wrong to assume that all EU member states have the same rules and regulations regarding driver’s license. *Hat tip to CEO, who sourced and sent me the doc via email. Both articles were published in English several years after mine and you are free to click through, but be aware that the info is grossly outdated and inaccurate, as is typical of official Greek government websites. This is why my articles are independently verified and combined with real-life experience. I started livingingreece.gr and wrote the article above before official government websites existed and embassies/consulates and English-language news began disseminating practical information on Greece. Many have repurposed my information without doing their own translations/research or gathering first-hand experience. Therefore, you are not necessarily getting confirmation from different sources. My last update contains first-hand details not available anywhere else, making my information easy to identify. Thank you for this! I’ve been wondering what to do – convert my TN license or what – and how to do it. But I’m not really sure I’m willing to give up my U.S. license so, I guess I’ll stick with that if it is valid here. Glad I could help in any small way. I haven’t given mine up in 10 years and actually renewed mine in CA when I was last there. Was easy, quick and without hassle. However, it should be noted that I do not drive in Greece very often and have never been stopped. If you drive often and there is the possibility of being stopped, you need to swap. Everyone I know who swapped for a Greek one said it was a huge hassle. Well, I just really don’t want to give up my U.S. license, especially since so many states have issues exchanging EU licenses (my parents live in Virginia – you can only exchange the license if it is from Germany or France). If it was easy to keep swapping back and forth, fine, but since my license is my second form of U.S. ID I really don’t want to give it up. Fantastic article – here is my situation. Question: What would be the easiest way to convert my CDL into a Greek DL? I would love to be able to do this by mail, or by hiring someone in Athens to help me do it. (are you interested???) Must I travel to Athens myself? What about my Military Service requirement? Anyway, this is a fantastic website. I’ve shared it with my whole family. Please respond if you have some spare time. Does a Greek Drivers license show your address like a US license? A – Yes, but it is nothing like a U.S. license. I saw some poor Greek student the other day trying to park, and he kept driving up on the sidewalk and the car lurched a few times. But, I thought to myself, he’ll pass and be on the road very soon. That thought scared me for a little while. A few years ago, a Greek friend of mine told me [with some pride] how his father had paid for the driving licences of his two sisters in their early twenties. This was because they drove so badly that it was clear they could never pass a test; so, the family sent one million drachmae by cheque in the post. The licences arrived by return post. You know something? I have no sympathy for the people who die on Greek roads with their awful driving, but I have a lot of sympathy for pedestrians and other victims who have to suffer this crap. Kat, I need some advice. My sister moved to Greece in 2006 and she had her purse stolen yesterday (along with her CA driver’s license). I don’t know how to help her. How can she get her CA license replaced? She doesn’t read Greek very well so I can’t imagine she can pass the driver’s test. I went to the US Embassy’s website and it basically states that if someone lives in Greece for more than 180 days, then they need to convert their US driver’s license to a Greek one. Granted, she should have done that over a year ago, she now can’t do it because she doesn’t have a physical driver’s license to show. I feel so helpless. Advise? Thank you so much Kat! You’re a lifesaver! I love your site! You’re on my faves now! It’s really nice that you’re trying to help out your sister. There are a lot of people here who do not speak Greek very well, but would like to help themselves somehow and that’s one reason I started this site in English. First of all, I’ve never found any written law that says we must absolutely swap, and I’ve inquired at the police station and transport authority, as well as looked through official documentation in Greek. So I’m not sure where the American Embassy is sourcing this information; I’ve found a number of inconsistencies in their information in other areas as well. A lot of people do not swap (including me in 11 years) because a CDL is worth more to me, and I never get pulled over here. Your sister should not feel bad about not swapping. Second, she could go through the process of getting a Greek license the hard way, that is taking hours of theory classes and practical driving courses. They offer them in English, but the thing is she’d have to pay thousands of euros (not an exaggeration) to learn something she already knows how to do. Last, the only way she can replace her CA driver’s license is to be in California and go to the DMV. Why? Because she is required to appear in person to give her thumbprint, sign her application and have her photo taken digitally. If she has no plans to be in CA anytime soon, I’m not sure what can be done because the requirements are pretty strict for security reasons. You could call them and see if there are any ways around (though I doubt it because of the thumbprint and photo). The good news is she wouldn’t have to take any tests, and once she completes the process, she can leave CA and have someone send her the license when it arrives in the mail. Should she not have an address in CA, either hers or a relative’s, she can actually apply for a duplicate or replacement driver’s license in another state where she or someone else does (i.e. you). Using NY as an example, she can request an abstract on letterhead from the CA DMV that verifies she did have a valid license there. With this abstract, she could apply with as little as her passport and SS card. I do not see anything about taking a thumbprint, and I do not know if they take photos digitally. You could inquire and see what can be done in her absence, though I suspect all proper agencies want applicants to appear in person. Just this weekend I thought I had lost my wallet with my driving licence in it (turned out I’d left it in a local shop and got it back yesterday) and so I’ll be looking into how to replace a UK licence – I’ll post here if I discover anything useful. What I would very strongly advise, though, is for anyone driving on a foreign licence to make a photocopy of it, keep that in your wallet/car and keep the actual licence in a safe place at home. I know it’s technically illegal to drive without having your licence with you but I know of a couple of cases where the traffic police have pulled someone over, been presented with a photocopy and made no fuss at all. Conversely, I’ve never heard of anyone being fined for showing a photocopy. From a brief look at the procedure for renewing a driving licence in the UK it seems that the issuing authorities can grab a photograph from a passport database, so I definitely think it’s worth a phone call to CA to find out if remote renewal is somehow possible. Good comment and information. Re: Vasso’s sister. The photo is likely no problem, but the fingerprint is also required for CA. Her sister may or may not still have an address there, which is the reason I used NY as an example in case another DMV is necessary. Just want to confirm this. Did you say that you are using your US drivers license in Greece and that you do not have a Greek license? Giving up my US license is also an issue for me but my situation is a little complicated. I have moved to Germany, my current license is from Texas which does not have an agreement with Germany as of yet (worse than not knowing Greek which I do) so my partner and I (who has dual citizenship GR/USA) were thinking to get our licenses in Greece and prevent this nightmare here in Germany. I am waiting for my Greek papers to be processed to get my citizenship on top of all of this. Would really appreciate your input and keep up the great work!! I’ve only had a US license the entire time I’ve been here because: a) I value my CDL as a form of ID and return to the USA to drive often enough where I will not give it up; b) it states my organ donation wishes, which is something you cannot get with a Greek driver’s license or jumping through a number of legal hoops to have these wishes stated in Greek; and c) I rarely drive in Greece and have never been stopped by authorities. Public transport is often faster than driving, affordable, convenient and environmentally friendly, in spite of the various manners and odors I suffer to be green. I assume you mean that you’re first getting Greek citizenship, since you cannot get a Greek passport without it; it doesn’t work in reverse. I also hope you realize that getting Greek citizenship is not enough. If you read the requirements in the article, it says you must have a Greek tautotita (#7), plus an AFM (tax number) in order to pay the fees associated with converting to a Greek driver’s license (#9). In order to get an AFM from the eforia (tax office), you must have a permanent resident address in Greece. Plus #12 states you must present a printed tax statement from the eforia (ekkatharistiko) or a utility bill in your name from OTE, DEH, a cell phone company or EVDAP as proof you have an established and ongoing presence here in GR. Everything I’m saying is already stated in the article above. Convert your US DL to Greek one and when first time you go back to the US issue a new one then you have two !! N – If you’re a Greek citizen, you cannot convert without a license from an EU country or a non-EU country listed above. You are expected to get a Greek license by paying for hours of theoretical and practical lessons. Even if your Thai license were a full license, Thailand is not on the list and therefore you do not qualify. So what am i to do? I dont want to go through the loooooong process of getting a greek license. Should i therefore just wait till my thai license is a full license then drive with an IDP or what? I have a document that states in english that the license is valid. Also on the license it has an english translation of the details. So in theory i could be able to drive in greece for that one year period then get a IDP after that right? In your original comment, you said you had “no problem with bureaucratic mumbo jumbo,” so it seems you’ve changed your mind. What you do is up to you. Once you decide to not follow the rules, you are at the mercy of the law and its consequences, unless you have connections to bail you out. If you are moving to Greece in one month and your Thai license doesn’t qualify you to get an IDP for almost a year, you’ll essentially be driving illegally for that year. Your Thai license entitles you to drive in Thailand, and it makes no difference if it’s in English; it is completely worthless in Greece, unless you have an IDP accompanying it. And if they find out you are living here and not a visitor, you are subject to fines and jail time. Good luck. I wrote to you on (Amalia wrote @ September 17th, 2008 at 18:50) regarding this whole license process. This is what I/we experienced in Jan. We currently live in Munich. We are both U.S. citizens, however one of us is also a EU citizen (Greek). We had all the proper paperwork sent from the Greek Embassy in Houston to Chania. When we went in to process our licenses, I, who does not have a Greek ID asked about the ‘Residence Permit’ that they require. They said go to the police station to get your residence permit. Went and was told that you are an American citizen, you need to go to your local Dimo to get the paper. Went to the Dimo and was told you do not need a resident permit as a ‘Greek/American’. She wrote this down on paper and I returned back to the DL office. They then said you must go to some other office to get your ‘license’. When we called them, it turned out that they would issue me an “International” Greek license that was valid for only 6 months to drive legally there. On the other hand my partner (the Greek citizen) went through loops and hoops to finally get her papers processed. When all the papers were finally completed/stamps etc. she took them back to the DL office and then it came; “Give us your American license’, she happened to be with her Mom who is very outspoken and had already called her attorney to ask about this. The attorney told her, they have no legal right to take her license. She relayed this to the ‘women’ in the office who were all well you know ……LOUD……and the mom said no we are not giving you her license. The manager from the back came out who had previously advised us and I may add had the same last name of my partner. When he came out the woman said nothing again about the US license and they left. Now the license is ready and mom went back to pick it up and sure enough the woman asked for the American license. The manager was not in but would be returning today. I will let you know what happens with all of this. I got absolutely nowhere without my Greek ID and I am not sure if that was right or they just didn’t know what to do. I would have thought that the Embassy would have said something to me if it was not possible. At this point, I have decided to exchange my Texas license for a MA one (where I am from) and then exchange my MA one for a German one. The Greek process is just waaaay too complicated, my God!!!! Texas and Germany do not have any agreements as of yet for DL exchanges as does MA. Some have said in Germany they try to take your DL and some say they have not. We will see and if so I will also request a duplicate license. Just to clarify things; we were going the Greek route because we need an EU license to live in Germany and would have had to pay lots and go through all exams and road tests here do to having a Texas license with no agreement. I never heard back from you about what happened, but I wanted to clarify a few things so readers can understand what happened to you and why. Hyphenated Greeks who are Greek citizens with Greek ID cards can try and swap using the process above as long as all of the other requirements are met. This is why your partner (Greek citizen) jumped through all those hoops to get her papers processed. Because it is a ‘swap,’ it is proper that they confiscate the U.S. license when giving your partner or her representative the Greek license. Swap implies there is an exchange. If it wasn’t a swap, or you don’t want to give up the U.S. license, your partner is required to complete and pay thousands of euros for both practical and theory classes, take exams, then get the appropriate certificates (same as Germany). If you are a U.S. citizen (of no Greek origin), they would have allowed you to apply for a Greek residence permit. Because you are a U.S. citizen of Greek origin, the woman was correct in saying you cannot apply. Why? Because you are of Greek descent/origin and have the right to claim Greek citizenship, a Greek passport and a Greek ID, whether you want it or not. If you don’t have them, you must get them to achieve what you’re trying to do and then jump through the same hoops as your partner to get a Greek driver’s license. The Embassy likely didn’t tell you all of this because they were uniformed or uninterested in helping you for whatever reason. This happens a lot, and many of these people come to this website for help. Btw, what they require in Germany is basically what they require in Greece for all countries not on the swap list. If you staked your claim and applied for Greek citizenship, a Greek passport and Greek ID, it would still cost much less time and money than taking exams and road tests. I would like to say your website is brilliant, and well written. I would like very much to befriend you. I respect your intelligence, and hope that I can come to you in the future for further advice. My current situation is this. I am an American living in the EU, but can’t exchange my licence in the country I am in. I was looking hoping to do some driving licence tourism, but there doesn’t seem to be any loopholes. It seems like they make it almost impossible to get a licence in most EU countries with their demand for proof of address, medical exams, translations, and residency requirements. I know that you have already gone through this in your post, but I thought I would ask you what you suggest for my unique situation. Your situation is not unique; it’s the same as everyone else looking for a shortcut. Therefore, my answer is the same. There are no loopholes, and these rules and requirements exist for a reason. As an American abroad, I do whatever I can to follow rules when it comes to bureaucracy because breaking them makes me vulnerable to someone else’s control. It also reflects badly on my country and fellow citizens. i have a question for you, a friend of mine was pulled over and told that if she is a resident than she is driving illegally and he said he would let her go this time but he would ticket her the next time. is there any way to know for sure if there is this law.